The Orkney and Shetland MP said: "It is ironic that many shops and businesses in London have signs indicating that they will accept euros." A Treasury spokesperson said the term legal tender did not govern the acceptability of banknotes. "Only Bank of England notes have the status of legal tender in England and Wales," the spokesperson said. "However, the term legal tender does not govern the acceptability of banknotes in transactions. "Whether or not notes have legal tender status, their acceptability as a means of payment is essentially a matter for agreement between the parties involved, which the Government does not currently regulate." Mr Carmichael said many shops and businesses continued to refuse Scottish banknotes. 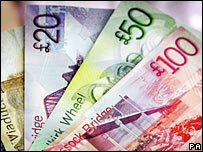 He told the BBC Scotland news website: "I always keep a couple of Scottish notes in my wallet." He explained: "Scots in England have no legal recourse whatsoever when their banknotes are refused, leading to embarrassment and irritation. "This situation is the result of historic accident and it is now time to address it." A Bank of England spokeswoman declined to comment as she said it was a Government and Treasury matter. Scottish banknotes have an unusual status. In 1826, the British parliament passed legislation preventing banks from issuing their own pound notes, a practice which was threatening to get out of hand. But a vigorous campaign in Scotland, which enlisted figures such as the writer Sir Walter Scott, ensured that it was exempted from the new law. In Scotland, three banks retain the right to print their own money: the Royal Bank of Scotland, the Bank of Scotland and the Clydesdale Bank.